The summer of Android super phones is heating up as Sprint and Motorola just announced two new Android phones, the Photon 4G and the Motorola Triumph. 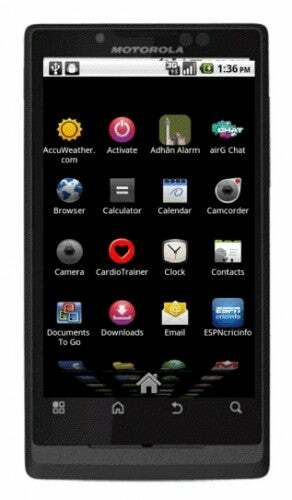 These are the first Motorola Android phones on Sprint. At a press luncheon in New York this afternoon, the carrier announced that it will launch 10 more Motorola devices in 2011. The Photon 4G will be headed to Sprint while the Triumph will be exclusively for Virgin Mobile US customers. The first dual-core phone to debut on Sprint, the Photon 4G is powered by an NVIDIA Tegra 2 processor and runs the latest version of Android, Gingerbread. It has the same gorgeous 4.3-inch qHD display that we saw on the Atrix 4G's as well as a similar webtop docking device (sold separately). When you connect to the webtop dock, you can access the full Firefox browser as well as a slew of specially-made productivity apps. The Photon has a lot of business features including Exchange support, enterprise security and ships with 3LM's Ready for Business software. It has 1GB of RAM and 16GB of onboard storage. It can also support a 32GB microSD card so you'll be able to store all the photos you shoot with its 8-megapixel camera. Like just about every high-end phone to come out this summer, the Photon also has a front-facing video camera for making video calls. And, as its name implies, it can connect to Sprint's WiMAX 4G network. phone with high-end specs available to prepaid users. The Triumph has a 4.1-inch WVGA display, dual-facing cameras (a 5-megapixel camera and a front-facing VGA camera) and slim design (it is only 0.4-inches thick). 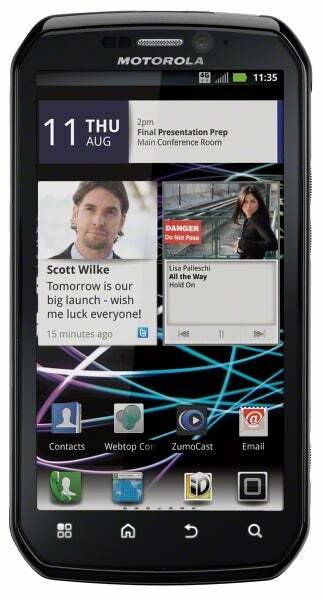 The Triumph runs Android 2.2 and is the first phone to come loaded with Virgin Mobile Live 2.0. According to Sprint, this is a social networking music application. I'm not really sure what it exactly does beyond letting you "check in" at various music events, but we'll try and get our hands on it and find out more. Interestingly, the Triumph ships with an HDMI port, something we generally see on more high-end phones, like the Photon. It is powered by a 1GHz processor and ships with 2GB of on-board memory (with a microSD slot expandable up to 32GB). Pricing and release dates have not been announced, but Sprint and Motorola gave a summer launch time for both phones. Stay tuned for our hands-on impressions of these two new Android phones.